These photos and comments from shellfish industry representatives demonstrate the vile obscenity that is perpetrated on Puget Sound's nearshore habitat by the arrogance and unmitigated greed of the shellfish industry. Beach residents, including some families that have been here for 70-100 plus years, are treated with contempt and disrespect. No environmental impact statements have been done. No studies on possible impacts to forage fish and salmon habitat have been completed. In fact, the shellfish industry lobbies long and hard for even fewer regulations! Seeing is Believing! "To some waterfront property owners this is not an attractive view. But beauty is in the eye of the beholder. To growers, this is attractive." becoming trapped in geoduck wildlife predator exclusion nets that are documented by CPPSH members. "We believe the environmental impacts are at worst benign, and at best they're beneficial"
"There is no science to support the case that geoduck farming is harmful to the environment"
North Bay Taylor Shellfish site. Prior to leasing the tidelands to Taylor, owner Reginald Engman destroyed the starfish by pouring quicklime on them. 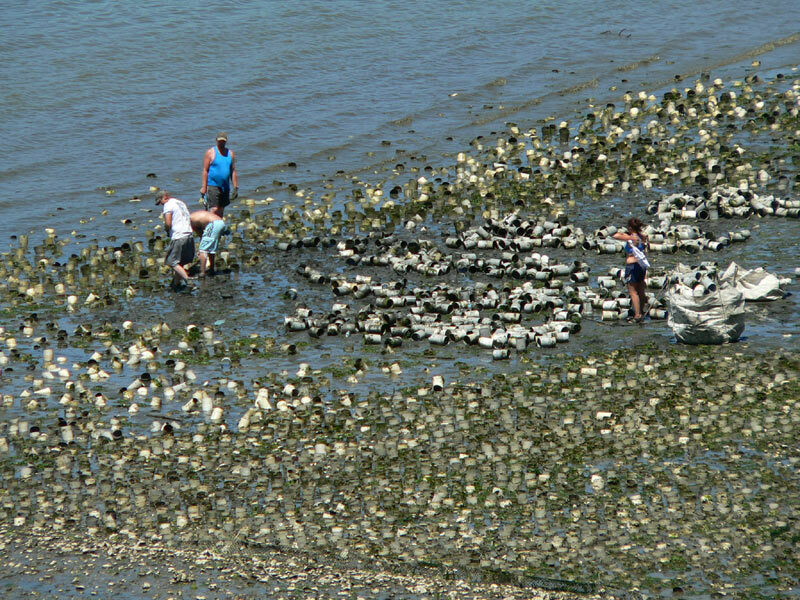 March 2010 - Seattle Shellfish removes thousands of Sand Dollars from tidelands near Steamboat Island and leaves them to die. "Private tidelands are misrepresented as residential and recreational beaches. (Pierce County) must recognize that the primary purpose of privately held tidelands is shellfish farming, and not residential recreation." contained vast meadows of eelgrass, which is priority fish habitat protected by both state and federal mandates. Taylor Shellfish Co., North Bay, Engman parcel, May, 2009. Dry intertidal hydraulic geoduck harvest. Taylor Shellfish Co., North Bay, Engman parcel, Winter 2008-2009. Barge, support vessel anchored for months, and used for wet dive harvest of geoduck. Dive harvest is occuring in forage fish spawn and fish habitat areas outside jurisdiction of DNR. "The scene was different ten years ago." "The NIMBY phenomenon was localized and only beginning to rear its ugly head." "Shellfish farming provides a supportive environment for other species"
"(Shellfish farming) has been shown to provide equal or better habitat than eelgrass for juvenile Dungeness crab." Pacific Coast Shellfish Growers Association. "...vocal NIMBY opposition groups that like to ask questions implying that there might be damage to the environment resulting from geoduck harvesting without having ANY science to back up their implied claims." "Try to remember that if it were not for those mussel farms in Totten Inlet, those geoduck farms slowly spreading throughout South Puget Sound, or all those oyster and Manila clam farms in both Inlets, Puget Sound's waters wouldn't be as clean. While you're at it, you might consider showing your appreciation for what the shellfish industry is doing for Puget Sound by buying some locally produced shellfish." "These are lifestyle changes that have to happen for the whole population. We have to go to everyone in Puget Sound watershed and get them to change their lives." "Burrowing shrimp as a whole have had a devastating effect on production in coastal estuaries". "Controlling them is beneficial to the estuary because removing shrimp boosts diversity". Taylor Shellfish HVLP stinger pump barge, North Bay, July, 2008. Taylor Shellfish, North Bay, geoduck harvest, July, 2008, in an area formerly populated by a large expanse of eelgrass. Taylor Shellfish, North Bay, July, 2008. 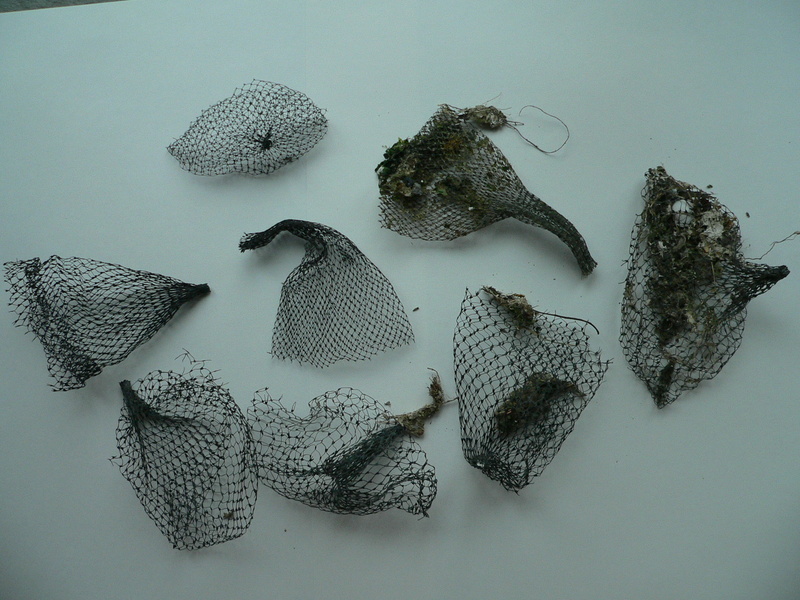 Installing wildlife exclusion nets. Taylor Shellfish, North Bay, HVLP pump barge, July, 2008.
contains about eight miles, or about 150,000 pounds of plastic PVC pipes. Seattle Shellfish, Spenser Cove, unnatural densities of geoduck in the intertidal, PVC debris, July, 2008. Incubator pools in Spenser Cove, arial view. Black Dolphins in Case Inlet, near Dutcher Cove, April 11, 2009. Orcas at Hammersley Inlet's Cape Horn, an area of dense shellfish aquaculture, 2009. Dead starfish from quicklime poisoning at North Bay site. Planted geoducks at North Bay, 2001. Prior to shellfish aquaculture, this area contained a vast eelgrass meadow. Taylor Shellfish employees raking up aquatic vegetation for removal to make way for geoduck planting, North Bay. Taylor Shellfish employees removing aquatic vegetation, planting geoducks, North Bay. Geoduck farm boundary in Totten Inlet. Mussel rafts at Galagher Cove, Totten Inlet. 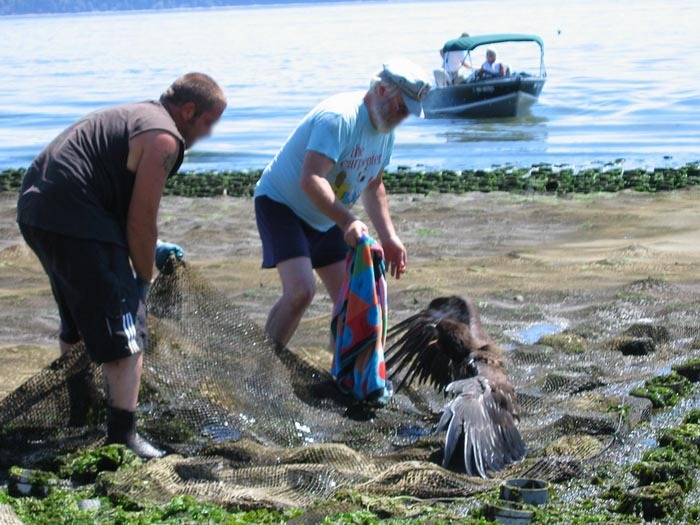 Eagle caught in geoduck predator exclusion net with rising tide, North Bay. Eventually this eagle was able to free itself. Invasive tunicates attached to plastic shellfish aquaculture trash (mussel disc), Totten Inlet, October, 2010.